According to the Urban Dictionary, ‘swirl’ is defined as ‘two people of different ethnicities hookin up.’ I prefer Urban Dictionary’s second most popular definition: A beautiful union between two people of different ethnic, and/or racial backgrounds. 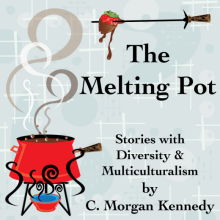 This months Melting Pot selections are romances that feature an African-American / black female lead with a white male love interest. Though one is contemporary and the other is historical, both stories address the unique social complications of interracial dating head on. Check them out and let me know what you think. The Wedding Date is quick read with well-developed lead characters and fun secondary characters. My only frustration was the feeling that a solid heart-to-heart conversation between the two leads would’ve diffused a lot of the conflict and misunderstandings throughout the story. Most romance readers frown upon such an easy fix and prefer more complexity in the reasons the two leads have difficulty coming together. However, the heat in their bedroom and the shear delight they have with each other more than makes up for the lack of strong conflict. The stakes are high and the cause is great for both Elle Burns and Malcolm McCall who are both working as spies in Virginia for different pro-Union organizations. With an unflinching eye on history, Ms. Cole explores the struggles, dangers, and beauty of an interracial couple during this time in American history. There are definitely some heart pounding close calls and scenes that will make your blood boil with anger at the injustices depicted in some of the situations the characters must face. However, the ending is so rewarding you’ll be ready to reach for the second book in the series. I purchased this book via Audible and listened to it during my daily walks. Let me tell you….there were days that my legs were SCREAMING at me to stop walking…I just had to hear what was going to happen next between Elle and Malcolm….so I kept on walking well past my step goal. In short, I HIGHLY recommend this story and I have already purchased book two.